Dog Ear Skin Problem Reader Question: I suddenly noticed many round patches of white scaly greasy feeling mater under the very long hair of my Porty's hair on his ears. Both on the top and underside of the ears. 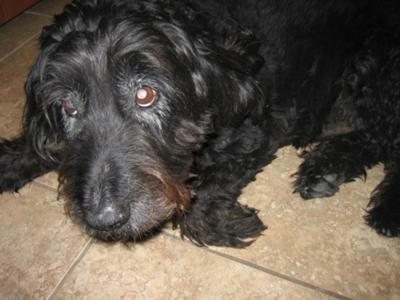 He is 14 and in great health and kept clean and doesn't really scratch at them and there isn't any dog hair loss. I am having a hard time trying to figure out what these lumps that I can scratch at (which then look like sores and are red) are and how to cure them. Hope you have some advise for me. I have changed him around on a couple wet foods that I add to his main dry food, but he loves his meals and is a super healthy dog in all respects. We live in a dry desert climate. Thank you for your question and sorry to hear about the dog ear skin problem. In the base of the hair follicle are sebaceous glands. These are sebum producing glands, which help retain moisture and makes the hair base suitable for growing hair. The number of these glands over the skin depends upon the density of the dog hair. As you mentioned, your dog is not experiencing any pruritus (dog ear itch) and on the spot where there is a problem, there is no alopecia (hair loss) and any signs of crusts except for the greasy dog sores which are red. This rules out several problems such as parasitic infestation, dog skin allergy and a dog ear infection. is experiencing typical seborrhea or an underlying disease which hasn’t shown its clinical features yet. Dry weather can be a factor, but this is only associated with causing symptoms, not the exact cause of the dog ear skin problem. Though it seems that this is a common case of seborrhea, you should check for the presence of other symptoms such as hyper pigmentation (dark spots on the skin), involvement of other parts of the body and closely watch to see if your dog has started eating and drinking more water then usual. Note other unusual symptoms. It is recommended that you consult a veterinarian, for a detailed clinical examination followed by an endocrinal analysis (hormone levels) and other laboratory procedures. Reaching a definite diagnosis is required in order to recommend a specific treatment. This is necessary so that all possibilities related to these symptoms are ruled out. For time being, in order to reduce the greasy condition and to help control the dog seborrhea and sores, you should try a Antiseborrheic medicated shampoo such as Clinical Care Anti Parasitic and Anti Seborrheic Medicated shampoo, which contains salicyclic acid. This will help to reduce the amount of greasy matter and also reduce any skin inflammation (sores). Once seborrhea is controlled, you should use a quality cleansing shampoo such as Lambert Kay Oatmeal & Baking Soda Shampoo, so that the oily content of the skin remains in control. In addition, try a natural skin tonic such as Skin & Coat Tonic to maintain skin and immune system strength and health. While this is probably a simple case of canine seborrhea, it never hurts to get a veterinarian's opinion to get a specific diagnosis. Please keep us up to date on your dog ear skin condition. After using medicated dog shampoos on the ears and those worked quite well, I found that changing to a high grade dog food without wheat, soy, corn, and nothing artifical and no preservatives, my pet is now doing GREAT. He is in his 16th yr of life and acts like 5. Has no problems and skin and hair is all cleared up. Sure you pay 3 times as much for their dog food, but you won't be at the vets and that's worth it! I have noticed my dog has dry little punps that can be easily scraped off all over one of her ears and around it. she sometime scatches them which causes hair lose. Also her ears are a dark pink sometime purple color. What should I do? thanks for all the great help. Actually, Vito has those other symptoms such as hyper pigmentation (dark spots on the skin)...I believe as his stomach area has all turned very dark over the past few years gradually and the sores that seem to heal on his ears turn black too. I did wash his ears immediately with DermaPet a MalAcetic shampoo for pets I had from the past and it helped a lot. I will follow what you said. He has always been a big water drinker, about a bowl a day. But he walks with me over a mile and a half a day.